Wow! 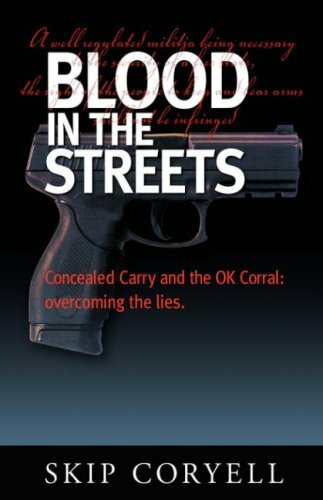 Skip Coryell's new book "Blood in the Streets" is good stuff! It's killer! Read it and hammer on! Upgrade! Ted Nugent, Legendary hunter, Rock-n-roller and author of "God, Guns, and Rock-n-Roll"
As you read Skip Coryell's book "Blood in the Streets" please remember the great heritage that our forefathers fought and bled and died for, and then passed on to us. Skip's book was written with that same spirit: the spirit of freedom and the spirit of "God, guns, and guts"! Read on and remember. Skip's message to stand up for what you believe in rings true in my heart and it will yours, too. It is a must read. It is not a book for the undecided. It is fuel for those of us that forge ahead, driven by an internal passion for patriotism, love of God, and gratitude for our father's sacrifice. M.Carol Bambery, NRA Board of Directors, MCRGO Foundation President and co-author of "A Common Sense Guide to Michigan Gun Laws"
A GREAT READ! Hard hitting, in your face, no holds barred information that's long overdue! If you're soft, get tough or give up! Stand up for your rights! Quit cowering to the committee of "they!" This book is full of experience, research and wisdom. A true masterpiece from the master! Skip gets the word out as it needs to be heard! You'll either walk away a better and stronger person.or there's no hope! Like Skip says, sheep are born and bred for one purpose: to be killed and to have their parts processed into something useful by predators. They stand on the hill and go "Baa", as they're being slaughtered." Don't say " Baa." Say " Stop or I'll shoot!" The choice is yours. Dar Leaf, Barry County Sheriff and NRA Training Counselor. Skip Coryell is the founder of the Second Amendment March and the author of seven books including his newest Stalking Natalie, RKBA: Defending the Right to Keep and Bear Arms, the Ted Nugent-acclaimed book Blood in the Streets: Concealed Carry and the OK Corral, the hunting novel Bond of Unseen Blood, and the Second Amendment novel We Hold These Truths. He is an NRA instructor and co-owner of Midwest Tactical Training, teaching CPL classes in Michigan. He also owns and manages White Feather Press.